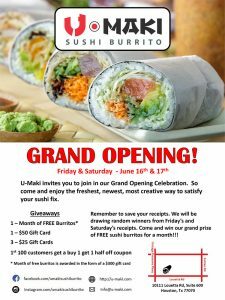 U-Maki invites you to join in our Grand Opening Celebration on Friday & Saturday — June 16th & 17th. So come and enjoy the freshest, newest, most creative way to satisfy your sushi fix. Remember to save your receipts. We will be drawing random winners from Friday’s and Saturday’s receipts. 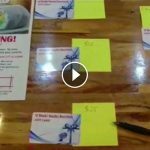 Come and win our grand prize of FREE sushi burritos for a month!! !